This is a ladies 24mm. 1920’s solid 18 karat gold ladies vintage watch with an interesting stepped bezel. 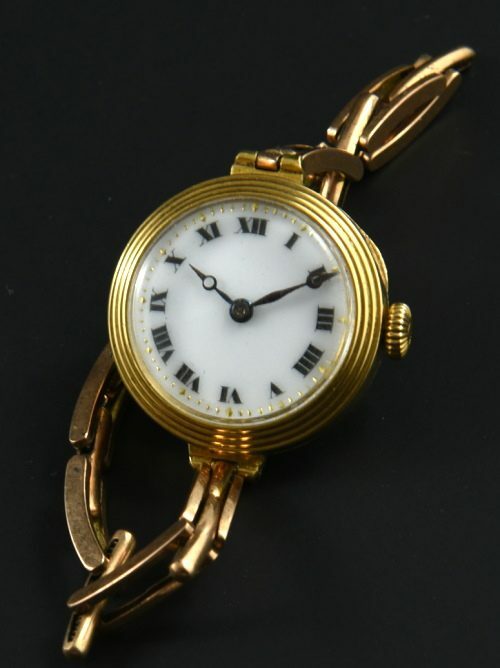 The original Roman numeral porcelain dial with gold minute markers and blued steel hands looks fabulous. The gold filled vintage bracelet will fit up to 6.5 inch wrist. The fine manual winding movement was just cleaned and is accurate. This solid gold ladies watch looks absolutely lovely!